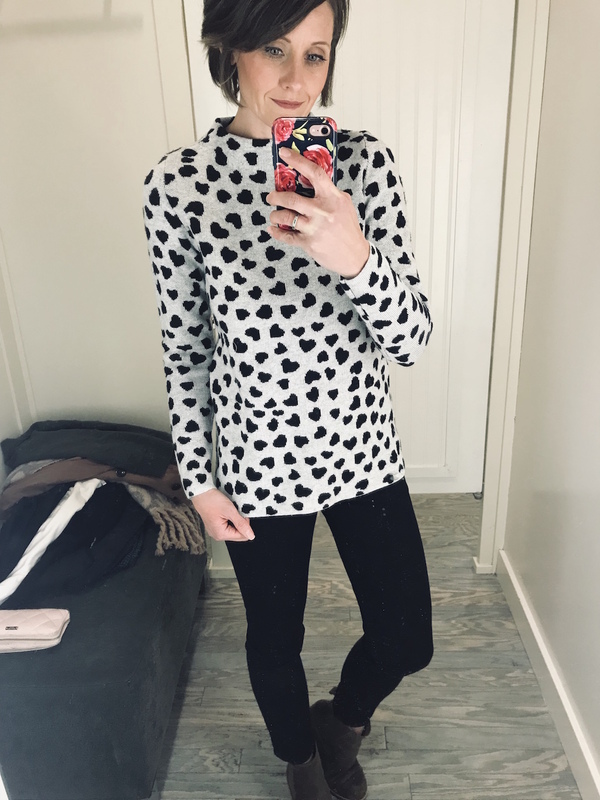 We’ll start with the cutest heart sweater that’s perfect all winter but most especially around Valentine’s Day <3 It runs true to size, I’m in an XS here for reference and like the fit although you could size up if you wanted a little more length. Next is this pretty wrap sweater. It’s not a true wrap which I actually like. It keeps everything in place so you don’t have to worry about any shifting. I love that this could be worn with skinny jeans and booties or trousers and heels. TTS, I’m in an XS. These are the pants I’m wearing in the above picture. I’m a sucker for a tuxedo stripe. As I’ve mentioned before, I’m prone to the ‘rear gap’ in many of Loft’s pants, and that holds true here. But if that doesn’t affect you, then you’ll likely adore these pants. 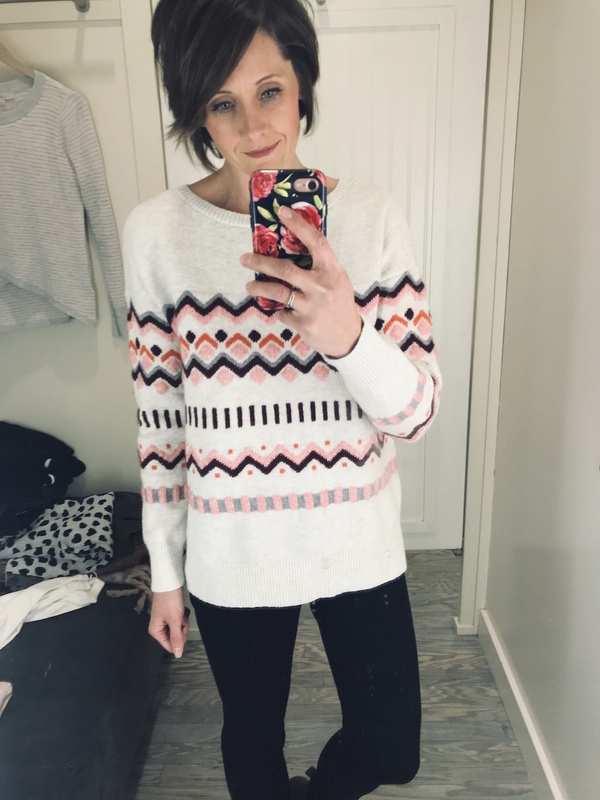 Such a pretty lightweight sweater. 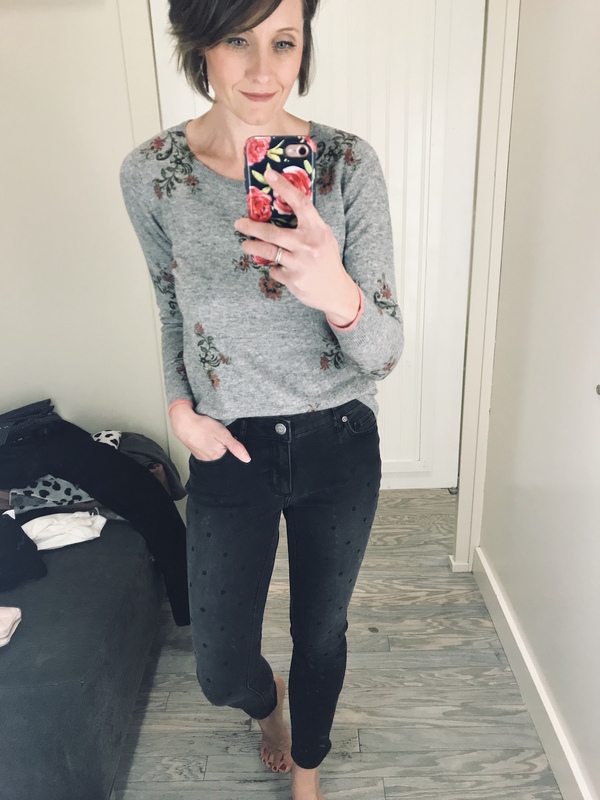 I love the floral print and although the neck is a bit wide, it lays nicely and would even look good with a button-up layered underneath. 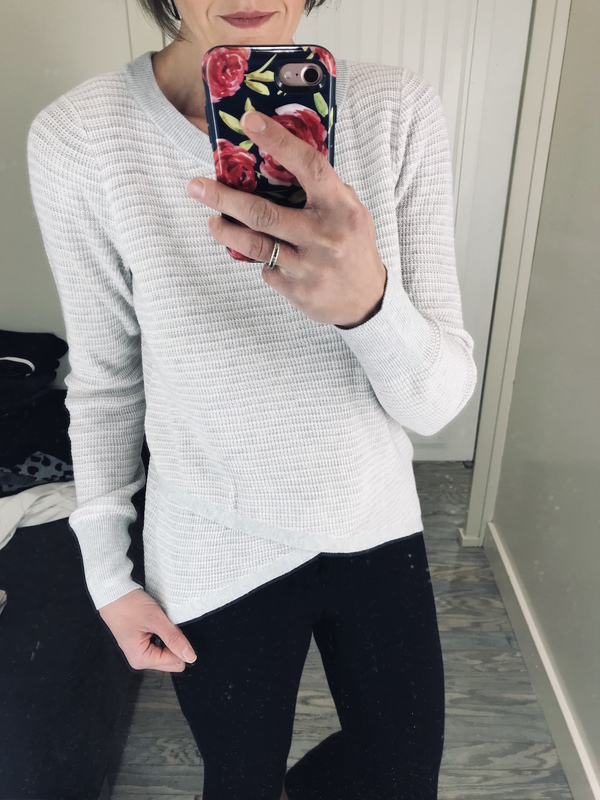 Fit is TTS, I’m in an XS here but I would have sized up to S for more sleeve length if I would have ended up purchasing. 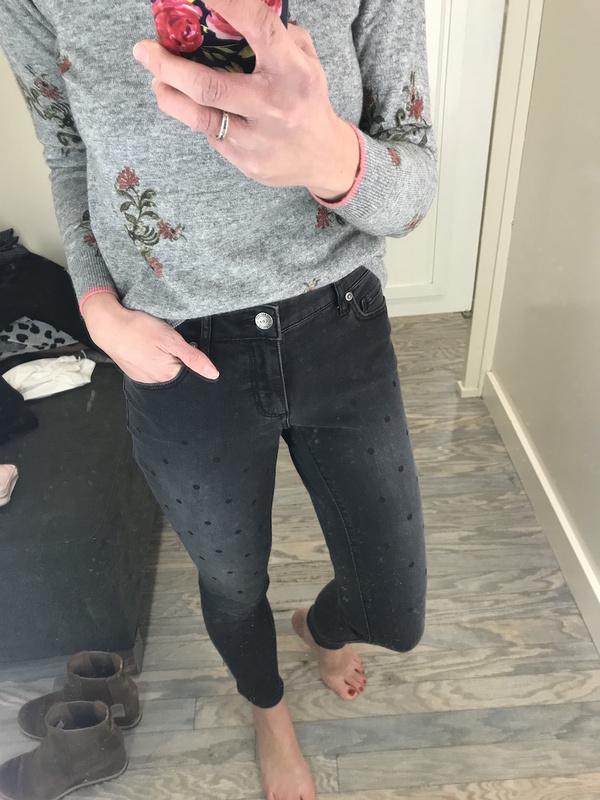 And of course, these adorable jeans. They have a great amount of stretch, so although I’m in my normal size here, I could have potentially sized down. 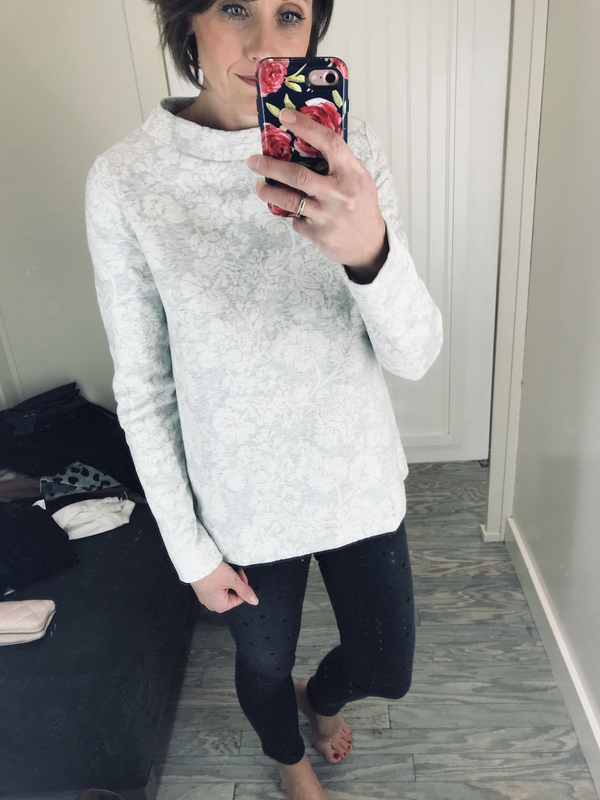 This top is actually referenced as a sweatshirt, but it’s the dressiest of sweatshirts. A skinny pair of trousers and some heels would look great with it. The pattern is beautiful and the neckline is so feminine and very Jackie O. How adorable is this sweatshirt. 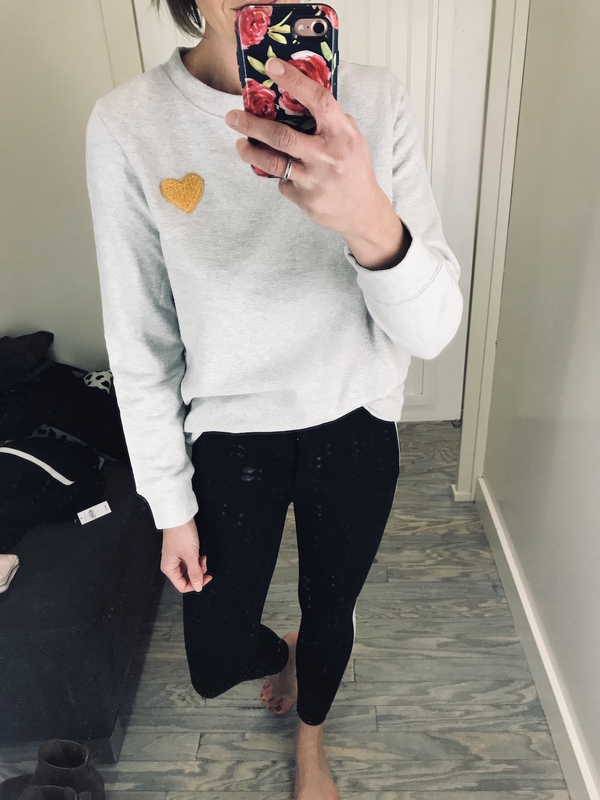 I true sweatshirt material with the sweetest little embellishment. I’m wearing a S here and would say it’s TTS. Yep, more tuxedo stripes! 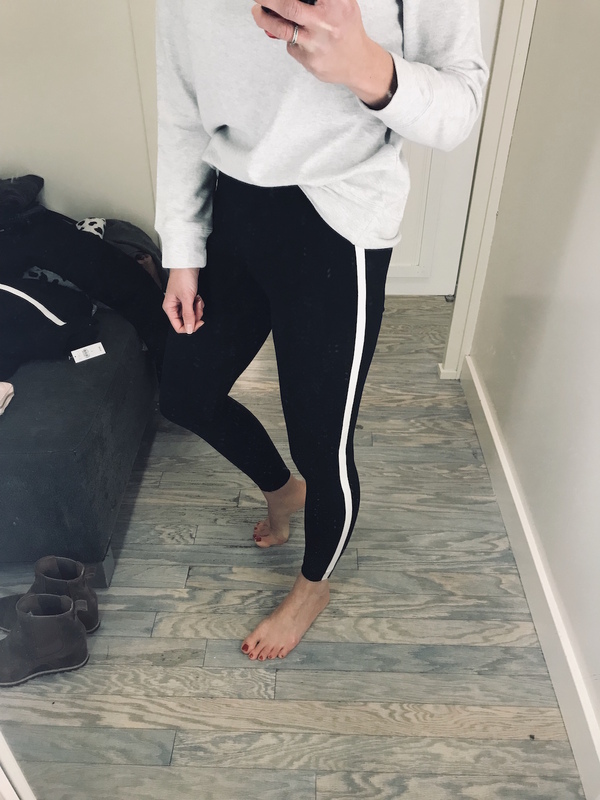 These are more of a legging but they have a zipper and hook closure making them a little more versatile for your wardrobe. I feel like this type of waist allows you do add a front tuck which you know is my bff. 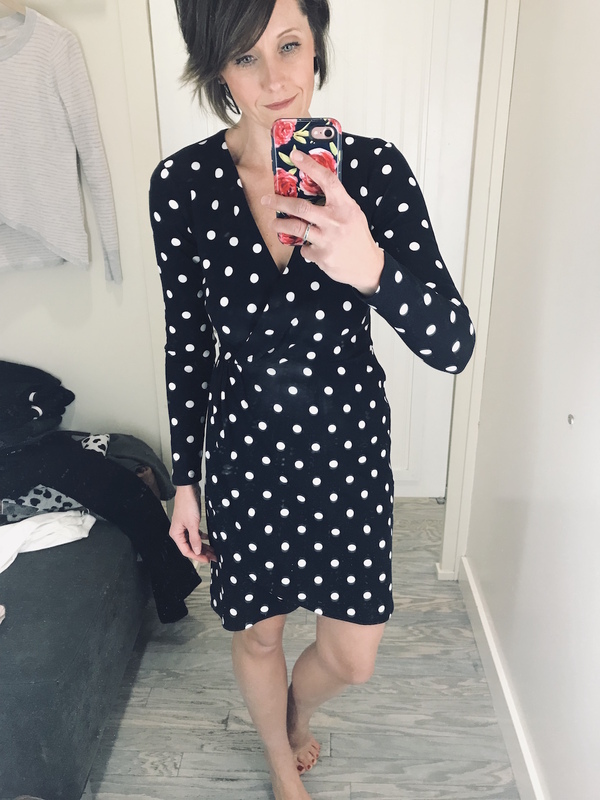 Such a great polka dot, wrap dress. 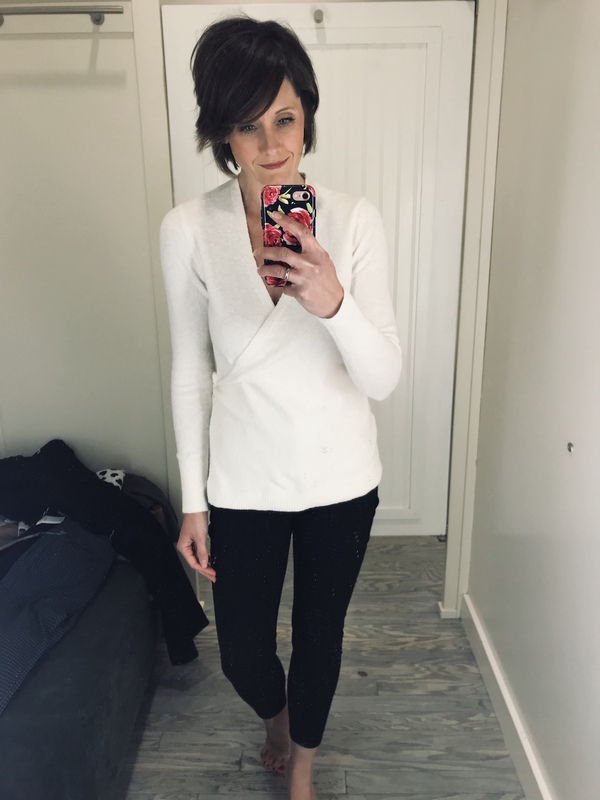 I love the navy/white combo, the fact that it can be worn for work, church or even a date night. The wrap is sewn in place and the dress zips up the back. It’s made of a thicker material so the shape is really great, keeping everything in place. 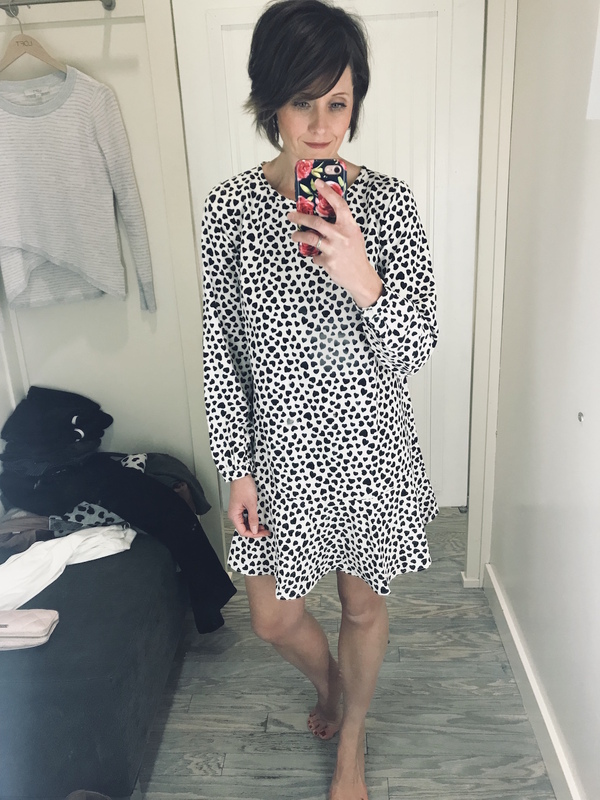 Oh ladies, this dress is so much fun! I’d pair it with some opaque tights and a cute bootie and earrings for date night (or Valentine’s Day). Fits TTS, I’m in an XS here. This top is like a glorified thermal. I love the split hemline and the soft blush/grey color combo. I’d wear it with a cozy pair of Lou & Grey sweats for a perfect loungy outfit. I’m wearing a S here but would have sized down to a XS because I think it looks better a little more fitted and less oversized. A terrible picture, but here I’m wearing the A+++ of all sweats that I rave about along with everyone else. Call me a creature of habit. Or maybe I just know what I like. 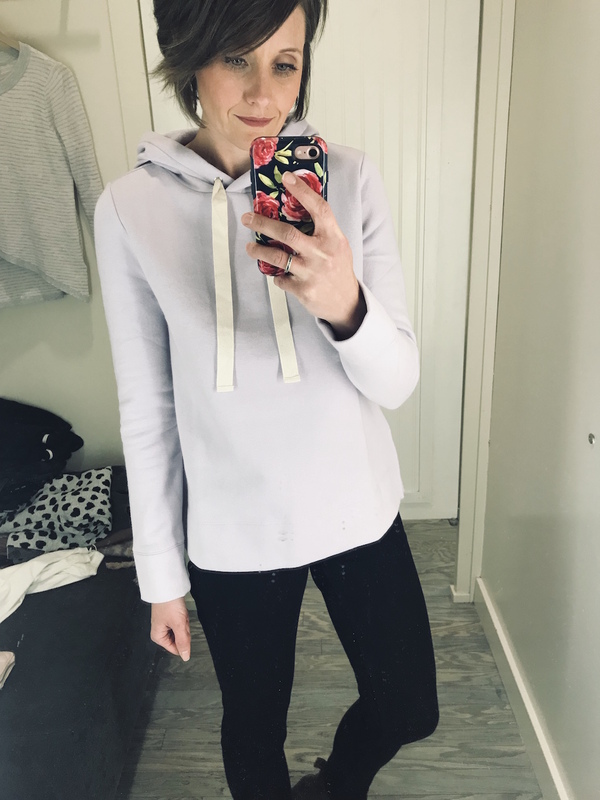 But a pastel hoodie is not something I’d pass up. I wore it all day yesterday and can vouch for the coziness. 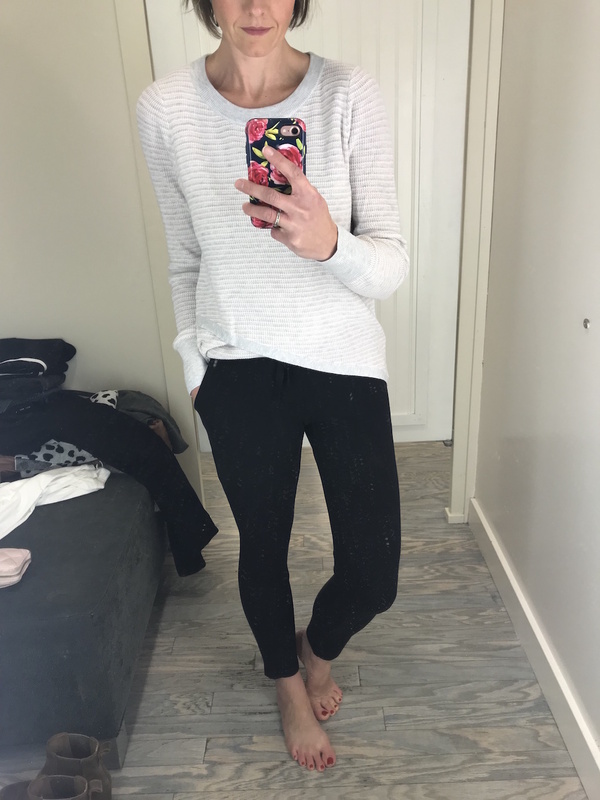 Perfect for lounging or traveling if you have any plans coming up. I’m wearing a S here, TTS. Here’s another good lounge combo. 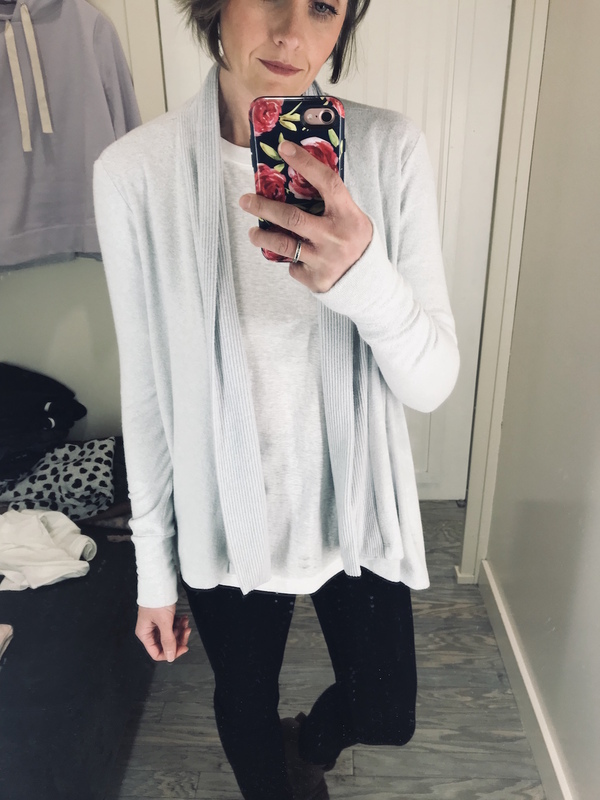 This open front cardi is the softest thing ever and the Lou & Grey long sleeved tee underneath is perfect for layering and comes in a few color options. 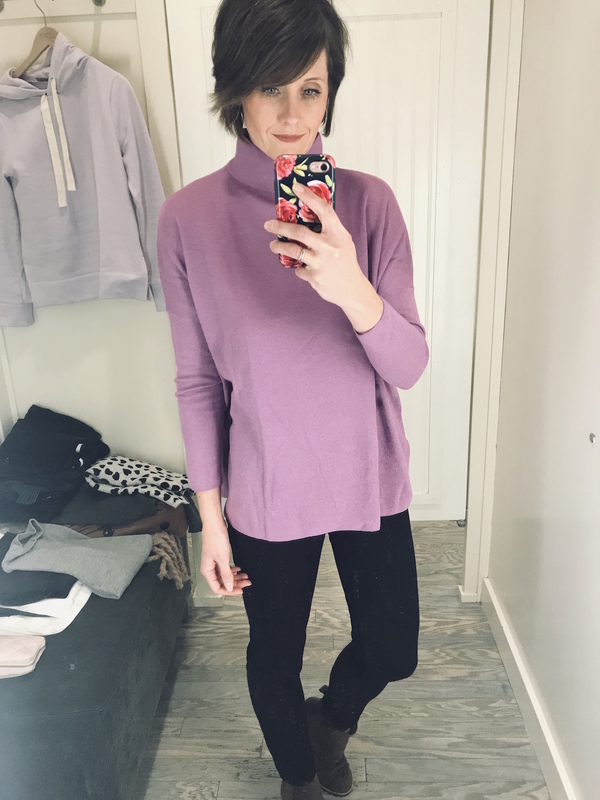 And finally is this cute Lou & Grey swing sweater. 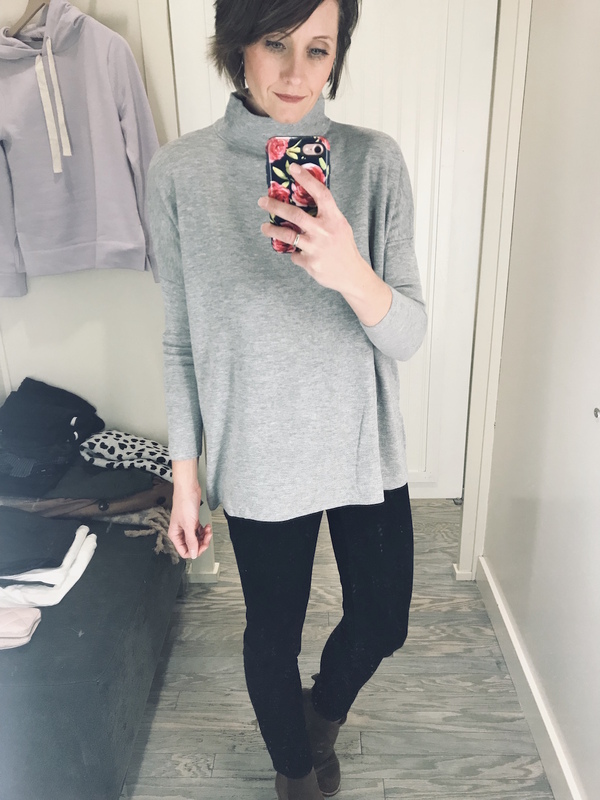 It has a dolman sleeve and lays really well. I’m actually sitting in it now as I type this from my fav little coffee shop. I paired it with skinny jeans, booties and my Nickel & Suede earrings this time around.